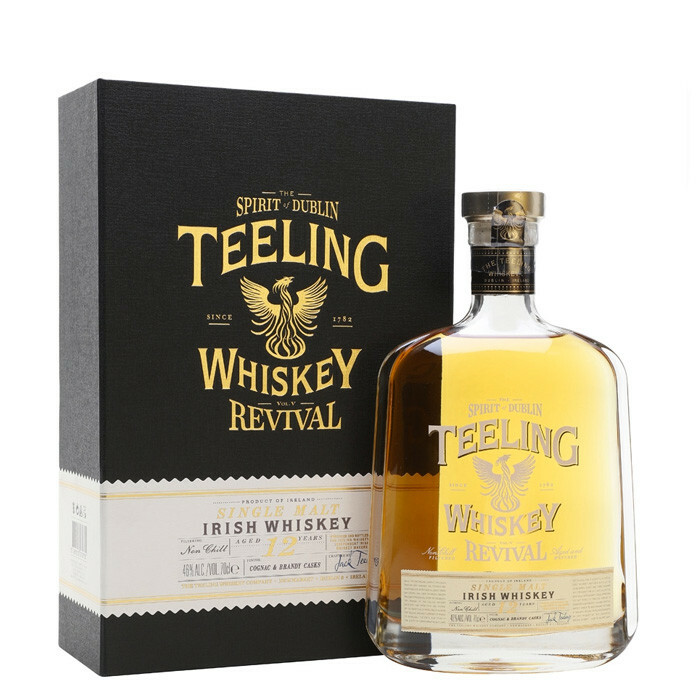 The fifth and final release in Teeling's Revival Series. Volume V is a 12 year old single malt that was initially matured in ex-Bourbon barrels and then finished in both Cognac and brandy casks. The whiskey has been bottled at 46% without chill filtration. Limited to 15,000 decanter style bottles. Dry finish with lingering notes of toasted almond & wood. Hints of toasted almond give way to freshly pressed grape & citrus on the nose. Creamy honey intermingles with floral notes, cinnamon & lemon peel taste. Nose: Buttery biscuits, green apple, cinnamon rolls, quince, hay. Taste: White grape, Jamaican Ginger Cake, soft tropical fruit, diced almond, a touch of mango chutney. Finish: Clementine, nutmeg and vanilla tannins.